Copyright © 2000 John H. Betts - This image is copyrighted. Unauthorized reproduction prohibited. 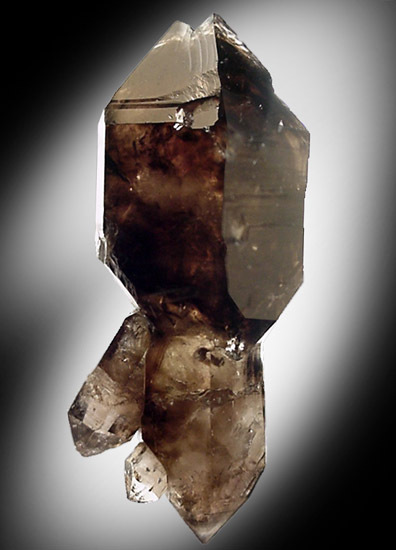 Doubly-terminated scepter formation of translucent smoky quartz. The cap is a 3.5 cm dark smoky crystal and the stem has two lighter smoky crystals 2 cm long. An unusual formation from a location that is getting harder to obtain minerals from. Overall size of mineral specimen: 6x3x2 cm. Size of individual crystals: 2-3.5 cm.